I'm feeling 4th of July withdrawal. No more fireworks to blow up. But I remember potato guns from grade school, and even a giant homemade potato gun my high school physics teacher made that could shoot entire russets, exploding them in midair. Looked just like my friend Cornelius' little brother Caleb blowing chunks after we dared him to eat French fries out of the trash at McDonald's. 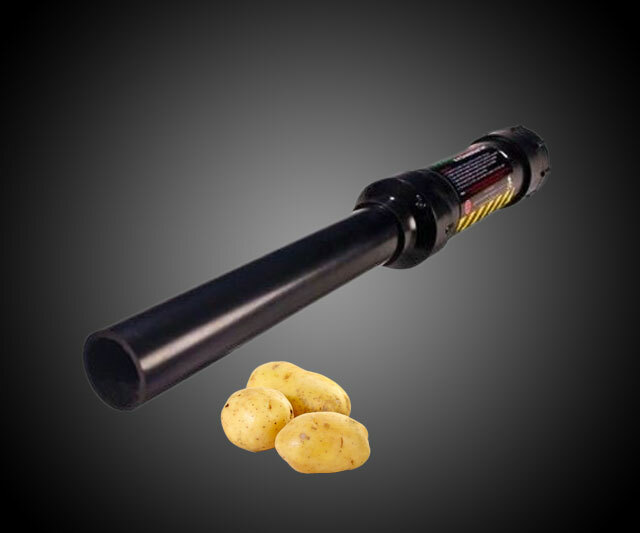 The point is, I'm in the market for something else to shoot off (something else else) and I'm glad to see they're still making potato guns. If Quarter Mile Cannon is to be believed, they've made some improvements in the last 15 years too. The Urban Warrior Potato Cannon is supposedly easy to handle, easy to carry, easy to store, and easy to fire off missiles up to...1/4 mile? Maybe not every time. Maybe not even most of the time, but reviews do concur that the 18" barrel + a can of aerosol hairspray blasts a potato pretty damn far. Quarter Mile Cannon also notes that the discharge achieves noise levels bordering obnoxious and shoots an 18" flame out the end. Perfect. The Urban Warrior Potato Cannon has an overall length of 31", with a 1.5" diameter barrel and 3" diameter chamber. Get the Quarter Mile Cannon attachment and you can also shoot tennis balls.